The Evergreen tyre brand is an increasingly popular choice with drivers around the world who are looking for a tyre that focuses on improving sustainability and reliability with an environmentally-friendly edge. Evergreen tyres centre around quality, with an advanced rubber compound make up that maximises grip while minimising rolling resistance. This helps to provide a longer-lasting tyre that gives drivers exceptional fuel economy. Tyres are manufactured in such a way that they are equally effective in both wet and dry weather, with no compromise on grip, no matter the road conditions. Evergreen car tyres have also achieved the ISO 140001 International Environmental Standard, a prestigious safety award. Evergreen EH22 - The ideal all-round road tyre, the EH22 is perfect in wet or dry conditions. the tyre has a strong focus on safety, with four longitudinal grooves which serve as an effective drainage solution to ensure excellent handling in wet weather. An innovative tread design also provides excellent vibration absorption to give drivers a comfortable ride. Evergreen EH23 - A radial tyre designed for high performance and maximum comfort, the EH23 makes use of a solid central rib to increase operating and braking performance significantly. The tread block layout on the tyre aids manoeuvrability while increasing rotary power. Meanwhile, the diverse distribution of pattern blocks makes for a more flexible tyre that improves driver comfort. Evergreen EU72 - A tyre built with fuel economy and handling in mind, the EU72 makes use of a silica based compound to provide low rolling resistance and decrease fuel consumption. The asymmetrical pattern and strong central rib provide excellent handling, quick braking and cornering response while the tread promotes even wear to maximise the life of the tyre. 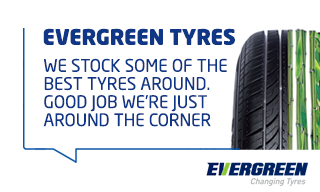 ATS Euromaster are proud to provide Evergreen tyre ranges in our service centres throughout the UK. For further information on Evergreen car tyres, make use of our ‘Find Your Tyres’ selector or visit your local ATS Euromaster centre where tyre experts will help select the right tyre for your vehicle and ensure that they are fitted correctly.